Download "Telesystem Visual Voicemail Android User Guide"
1 Telesystem Visual Voic Android User Guide Visual Voic - Android The Visual Voic app allows you to listen/delete/read your messages 1 from your Android device. Before downloading the app from the Google Play please contact Business Relations at NOTE 1 : After downloading the app, you will find the Visual Voicmeail app on your smartphone. Upon opening Visual Voic for the first time Click on the Visual Voic icon. The installation wizard will appear. Select the I have an account button. On the Account page enter the information requested. Click Next. Account Number - 10-digit phone number associated with the voic box you wish to access. Pin/Password - The Personal Identification Number (PIN) for the voic box. This is the same PIN you would use to access your voic over the phone. Organization ID - Must display Commercial (this should be pre-populated). The app will validate your account information. Initial Setup Greetings From the Greeting Setup page you may record a new voic greeting or new name announcement by clicking on the appropriate option. If you have already recorded a greeting and/or name announcement when you setup your voic box, prior to installing this app, and you do not wish to make new recordings just click the Next button. 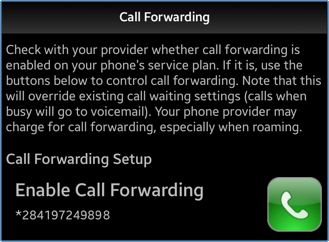 Call Forwarding Enabling this call forwarding setting will send inbound calls to your mobile phone to your Hosted VoIP phone when it would typically send the caller to voic so the call does not reach your mobile voic . If the call is still unanswered at your VoIP phone, it will be sent to your Telesystem voic . For example, if your cell phone rings 5 times before it sends the call to voic and your office phone rings 4 times before it sends a call to voic , with this configuration someone who calls your mobile phone will here 9 rings before they reach your voic box. 2 To Play a Message After the message has finished loading, click on the message to open it. Depending on your settings, the message may start to play automatically or you will need to click the Play button at the bottom of the screen. If you have subscribed to the transcription service, a text copy of your voic will also appear. You can then navigate the control bar to pause, restart, fast forward or rewind the message Transcription: If you have the transcription service assigned, your voic will be transcribed into text and a short preview of the text will be shown. To view the full transcription, select or click the message. NOTE: Based on the length of the voic , the transcription may not appear at the same time as your message. Once the voic has been fully transcribed, it will appear when you open the message. To Call Back from a Message Open the message from your inbox then click the Call Back button left you the message. to automatically return the call of the person who NOTE: This feature will call back the number shown on your Caller ID. If the number is blocked or unavailable, you will not be able to use this feature. Also, the number show may be a mail number of a company and not the direct number of the individual. The device you are using the app on must have the ability to place outbound calls. If you are calling from your cellular phone, the person you are calling will see your cell phone information on their Caller ID. To Delete a Message There are two ways to delete a message from the app: Open the message from your inbox then click the Delete button the bottom of the screen. at Or, from the inbox, click the 2nd tools icon at the top, right-hand corner. The app will display a list of all of the messages. Place a check in the box preceding the message(s) you want to delete, then click the Delete button at the bottom of the screen. NOTE: Once deleted, the message cannot be retreived. 3 To SMS (text) From the Message To reply to a message with a text or SMS message, open the message from the inbox then click the icon at the bottom of the screen to show more options. Choose SMS from the menu. The New Message screen will open and populate a text message with the phone number the individual called from. Enter your message and then click Send. NOTE: The individual must have called from a device capable of receiving text messages for this feature to work. Outgoing text message will show that they came from your mobile phone, not your Telesystem Hosted VoIP Phone System number. To the Voic Message Open the message from the Inbox. Choose from the menu. An wil open with the voic attached as a.wav file. If the caller is part of your contacts and an address is stored, the To field will be populated. For all others, you will need to enter the address. To Add a Contact to Your Device From the Inbox, click the + sign to the right of your message. This will open up your device s contact screen. Enter the information associated with the contact and press Save/Done. To Change Your Settings From within the app, press the device s menu button or click on the main settings button from the inbox. 4 FAQs Greetings The Greetings/Manage Greetings section allows you to review/record change the greeting played to callers. The options available are: System Default: The system default greeting cannot be modified, but when selected, it will play the following message to callers: Hello, the party you are trying to reach is unavailable. Please leave a message after the beep. When finished, you may press the pound key for more options. Thank you for calling. 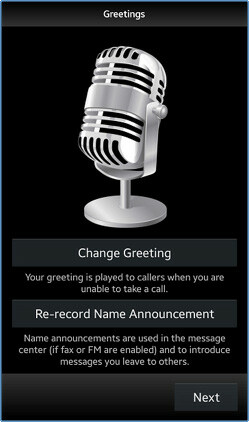 Custom: The custom greeting overrides the system default and when recorded, will play to callers. 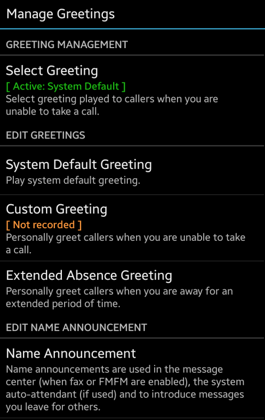 Extended Absence: The Extended Absence greeting allows you to record a secondary greeting that can be played to callers when you will be away for an extended period of time. Name Announcement: This will play the name associated with the mailbox (Example, John Doe). Activating Greetings Press the Select Greeting option, then press the greeting you wish to activate. To save, press apply. The active greeting will appear in green under Select Greeting. Recording/Re-recording/Playing Greetings Under Edit Greetings, select the greeting you wish to modify. To record, press the red circle button. To save the recording, press save. To play a recording, press the green play button. 5 FAQs Continued Call Forwarding This feature allows you to use your Visual Voic App for both your office phone and mobile devices. In order to do this you must forward calls from your cell phone to you Hosted VoIP Phone System when they would typically go to your mobile provider s voic system. After the call is forwarded, your office phone will also ring the preconfigured amount of times before the caller is eventually sent to your Hosted VoIP Phone System Voic box. For example, if your cell phone rings 5 times before it sends the call to voic and your office phone rings 4 times before it sends a call to voic , with this configuration someone who calls your mobile phone will here 9 rings before they reach your voic box. PIN/Password From the Change Password section you can update your Voic PIN. To do this, enter your current PIN and then enter your new PIN twice in the designated text boxes. Click Done to save your changes. The app will update your stored credentials on the device that it was changed. However, if you also have the app on other devices, you will need to update your login credentials on each device manually. This is the same PIN you use to access your voic when dialing into the voice portal. Organization ID This field should show Commercial. Do not change this field. Changes will result in errors when trying to access the app. Account This should be the 10-digit phone number associated with your Telesystem account. Options/Miscellaneous Auto play message/voic When enabled, the app will automatically begin playing the selected voic . When disabled, you will need to press the play button to listen to each message. Ask before deleting When selected, the system will prompt you to confirm you wish to continue before deleting a message. NOTE: Once a message is deleted, it cannot be retrieved. Salesforce This is a future enhancement which will allow you to link a message to a Salesforce.com account. Troubleshooting If this is present on your device, do not modify any of the settings. Personalizing Your Individual Phone Line Setup For assistance, please call 1-800-453-2251 ext. 102. Hosted PBX Administrator Quick Start Guide 3/11/15 LOGIN Go to http://portal.hpbx.telepacific.net/ You can also login from insidetelepacific.com/portals/tpac-portals.asp, select TelePacific Hosted PBX. Asterisk Voicemail User Reference Chapter 1. An Overview The Asterisk PBX offers a highly flexible, highly capable voice mail system. Among the features that it offers are: Three different types of greetings. MANAGED VOICE SOLUTIONS QUICK START GUIDE WELCOME Welcome to Mediacom Business Managed Voice Solutions! This guide is intended to get you up-and-running for the basic features associated with the product. Voicemail Shortcuts The following shortcuts are available while listening to a voicemail message: *1 REPLY to this message. *6 Play the NEXT message. *2 FORWARD this message. *7 REWIND the message 10 seconds. Assistant-Enterprise Toolbar Go to http://www.vc3.com/support/pages/voiceadvantage-guides.aspx to access the toolbar download. GCI VOICE Auto-Attendant Voicemail User Interface Onboarding Guide gci.com/business 08.17.15 2 Note: Please do not attempt to setup or change your Auto-Attendant feature by calling in to the MediaBox. VoIP Phone Quick Start Guide What is VoIP? VoIP stand for Voice over Internet Protocol. This means that instead of using traditional phone lines to transmit calls, VoIP phones use an Internet connection.